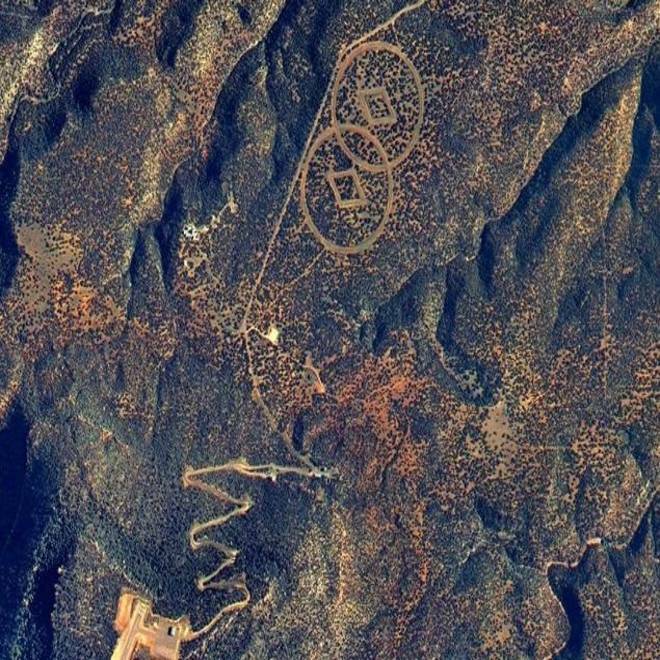 Satellite imagery shows a zigzag road leading to a pair of circle-plus-diamond symbols created in the New Mexico desert. A Scientology spokeswoman confirms that the facility is home to a scriptural storage vault. An underground storage vault built in the mountains of New Mexico has returned to the spotlight as a purported "space alien cathedral" linked to Scientology. The site, which features an airstrip and two 1,200-foot-wide (360-meter-wide) symbols on a mountain next door to Mesa Huerfanita, makes a splash in a new book and several spin-off press reports. But it's actually been known about for more than a decade — and has nothing to do with flagging down aliens. "As has been covered in the media for years, the facility is a Church of Scientology archival storage for the preservation of L. Ron Hubbard's scriptural writings and lectures," church spokeswoman Karin Pouw told NBC News in an email. "Archival sites are common among religions, such as the LDS faith's large genealogical archive in Utah and the Vatican archives." The storage facility, popularly known as the Trementina Base, is about 200 miles north of Roswell, N.M. It's featured in "The Church of Fear: Inside the Weird World of Scientology," an e-book by BBC investigative journalist John Sweeney that went on sale today. In an excerpt published last week by The Sun, a British tabloid, Sweeney quotes his sources, including an ex-Scientologist, as saying the circle-and-diamond symbols carved into the mountain were designed to guide church leaders to Hubbard's works "after a nuclear Armageddon wipes out humanity." Pouw said the remarks in The Sun and in Britain's Daily Mail were "fiction." The Sun's headline called the symbols a "giant 'hello' to E.T." — but Pouw said they had a more mundane purpose. "Because [the facility] is in such a remote area, the most practical way to it is by air," she wrote. "The corporate logo of the church that operates the facility is carved into the ground to help pilots find the facility. This, too, is commonly done by major corporations." The Church of Scientology is known as a secretive religious organization with some out-of-the-mainstream beliefs — for example, the claim that extraterrestrial civilizations have intervened in earthly affairs over millions of years. It’s also known as a church with some big-name believers, such as Hollywood actors Tom Cruise and Kirstie Alley. As Pouw noted, the New Mexico vault and the symbols have been the subject of news reports going back at least to 1998, when ABC's "20/20" program broadcast footage of the facility. Many of the past week’s accounts have suggested that the base is a newly revealed secret — in fact, the links to a Scientology-affiliated organization are as clear to see as those circle-and-diamond symbols. The symbols were trademarked long ago by the Church of Spiritual Technology, or CST, which says it's an autonomous church created "outside of the Scientology ecclesiastical hierarchy" to preserve and archive Scientology's scriptures. On its Web page, the CST says it has preserved Hubbard's works "on more than 135 tons of archival books, stainless-steel plates and nickel-plated records." "These materials are, in turn, stored in 2,300 titanium capsules housed in calamity-proof vaults to ensure the timeless preservation and survival of the Scientology scripture," the CST says. So what's new about Sweeney's report? Mostly, it's that he made the effort to drive as close as he could to the New Mexico site — all the way up to a locked steel gate, watched by security cameras. "I press an intercom button," Sweeney writes in The Sun's book excerpt. "A voice says 'Hello' in what sounds like a Scandinavian accent. I announce that I'm John Sweeney and ask nicely for a tour. We are not invited in and the intercom simply spouts white noise. We drive back to civilization, wondering what kind of religion builds a space alien cathedral underground."